We have weekly conversations around our morning coffee break. Topics are directed to personal development and small business operations. Liz Falcigno started blogging and share her passion for good food in 2013 - she has been consistently growing her audience and building an amazing website filled with helpful information, recipes and resources. Her story of consistency is very inspiring and once you'll want to hear. Daniel Gills from ASSA ABLOY sits down with us during the Medeco Security Center Conference in San Antonio, TX and discusses ways he navigated his career through ASSA ABLOY. Our in house App Developer, Lucas Ward joins us for a discussion on how to Observe, Document, Refine, Develop and Repeat for process improvement. A unique spin is added someone from outside your industry to eliminate assumptions of how a process should work. 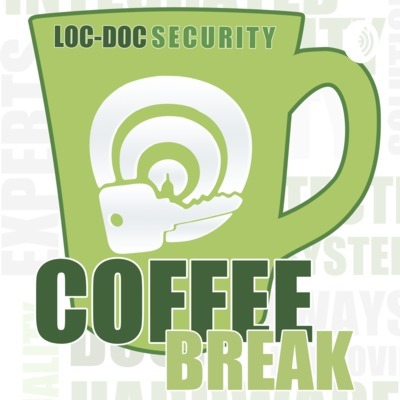 This is a unique episode of the Coffee Break Podcast - we took the whole show to San Antonio, TX as we get prepared for the ASSA ABLOY MSC Conference. We sit down with Lars Johnston of Calgary Lock and Tony Hokanson from Bloomington Security Solutions to understand how they are measuring success in their businesses and understand the importance of metrics and scores. Jake Fehling from Movement Mortgage joined us to discuss his professional journey and how he is working with the Movement Mortgage Brand to teach it's loan officers how to build a personal brand and focus on providing relevant content to their network and customers. After connecting on Instagram, Uriah Ortiz asked if he could visit our company and see how our organization is operating with 31 team members. While he's visiting, he shares his inspiring story of how he started small and grew his business over the past 9 years and how he's not done yet! In this episode, we discuss how Andy utilizes KPI's and Business Metrics to help coordinate sales initiatives and communication with a sales team across the entire United States. Chris Berger joins us to discuss his local artisan coffee roasting company Sugar Creek Coffee Roasters. He also handles corporate communication for Atrium Healthcare and we have a great discussion on communicating change within your organization. Chris Brown joins us from Nashville, TN to discuss how each life experience has built upon each other and brought him to his current adventure. Chris also offers great advice for business owners, leaders and individuals who want to stay focused on personal development. E4 - Johnny Fly Co. In this episode, we meet Johnny Freeman who is the founder of Johnny Fly Co. the eco-friendly fashion brand had humble begins around a dining room table to launching a worldwide wood frame eyewear line and eventually launching a physical retail location. Johnny shares his story and how they arrived to the brand they are today. 37 Year Radio Veteran and North Carolina Senator Carl Ford joins us to talk about how he's set goals, learned from failures and stayed focused on never giving up. Joining us from Virginia, our in studio guest Marko Galbreath (T4Tactics) as we talk about how he's found value in collaborating on security solutions with a unique relationship. E20 - How was your 2018? A fun episode of talking with Ben Sultze (ASSA ABLOY), Aaron Beaver (Elwood Digital / The Suffer Club) and Chad Lingafelt (Loc-Doc Security). Discussing memorable moments from 2018! We talk with Michael Ly about small business and how you can use virtual companies to scale your company. We have a conversation with Garrett on starting a coworking company and how his community engagement drove his desire to provide a working space for others to launch their dreams. During all this, he opens up about self-awareness and dealing keeping your mind sharp. We chat with our Canadian friend, Lars Johnston from Calgary Lock. The conversation dives into how we are building our teams by improving our hiring technics and getting the right people on our team. Part 3 of our series on our organization’s Core Values. Josh Norris from Green Brothers Juice in Charlotte, NC stops by with smoothies and a discussion on how why he started a juice business. Defined EXPECTATIONS Don't be frustrated with unmet expectations when YOU have not clearly set them. Can the customer or teammate execute the expectations without further explanation? Professional Photographer Austin Marvel joins us to discuss ways to add value to your customers and developing a marketing message to share with your customers. Commercial Real Estate is a industry affecting many other industries. We sit down with Brian Smith of Regent Commercial Real Estate to understand the industry. A conversation with Aaron Beaver of Elwood Digital and the Suffer Club on how he's gotten his skill set and how he started his own business. Join us around the table for our morning Coffee Break. This week Kevan, Chad and guest Steve Brisson from Security Lock and Key from Lynchburg, VA discuss transactional vs. relational sales and how it's impacted their businesses. Grab a cup of coffee and join in.